One look at this adorable little fellow, and it was love at first sight. 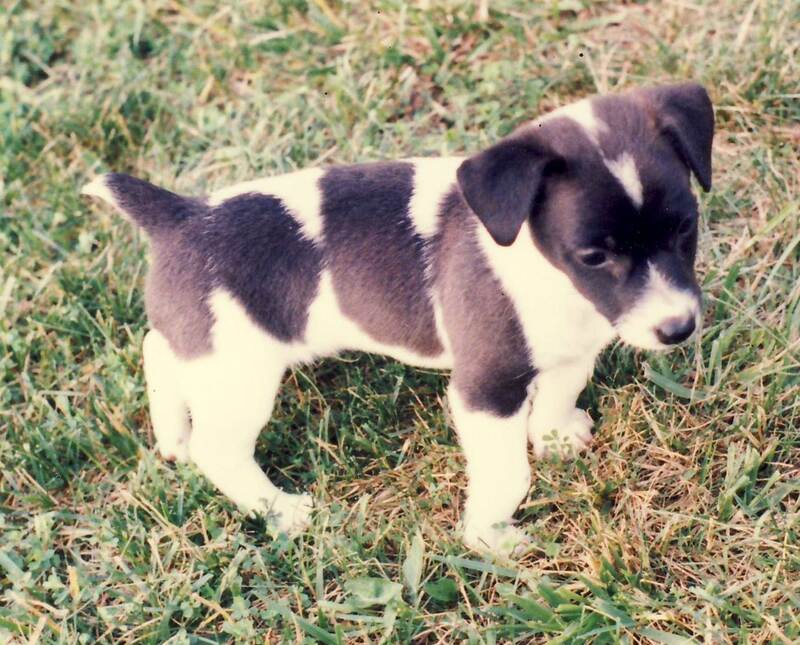 He was barely six-weeks old and not even as tall as a soda can when he joined our family in 1995. You’d think we could quickly come up for a name for the pint-size Jack Russell but, alas, we all had differing opinions. “Oreo” seemed a perfect choice to me. Our youngest son insisted on “Milo” after the hilarious dog (also a JR) in the popular movie, Mask. Hubby declined to enter the fray as more names flew this way and that, with no decision in sight. I threatened to stick with “Taco,” while our youngest dug in his heels all the further. He won out in the end, and by the time our energetic black-and-white ball of fur finally topped out the soda can, Milo finally had his name. A similar scenario unfolds in Shades of the Past, consciously or unconsciously inspired from that time. When the Marrables take afternoon tea on the east terrace, young Geoffrey’s new puppy is still in need of a name. 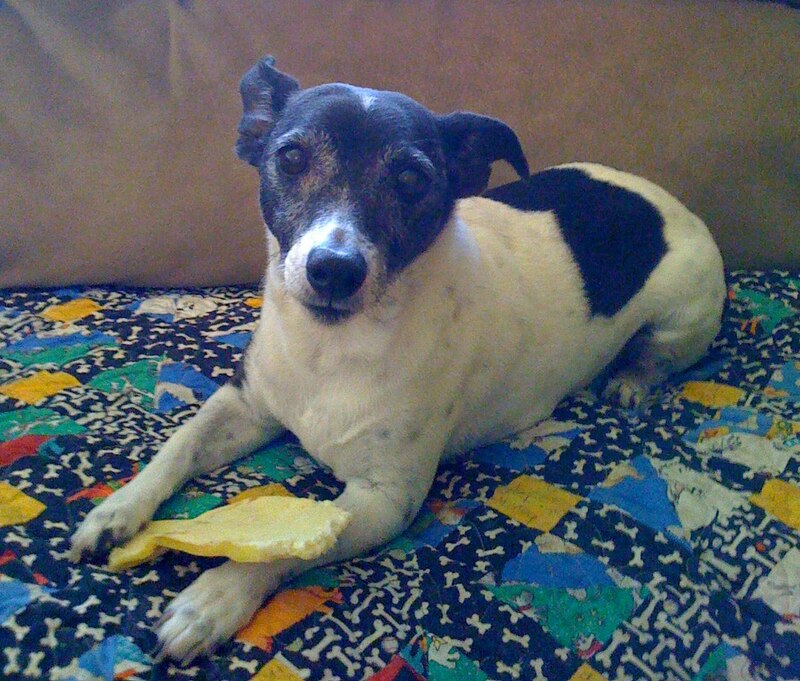 His mother, Cissy, prefers “Crumpet” while his father, Lord Henry, deems it silly to name a dog after food. "I think a better name would be 'Henry,' Henry," Cissy countered, sending him a mischievous smile. When Geoffrey next bites into a “Fat Rascal” – a plump, scone-like cookie – it breaks, half falling to the stone terrace. The puppy gobbles it down and, voilá, he earns his name, Rascal – in reference to a scamp, not a cookie, Lord Henry insists. Cissy and Geoffrey think otherwise. While developing the terrace scene, I scoured period cookbooks for an authentic Victorian cookie (“biscuit” in Brit-speak) that would fit my purposes. Fat Rascals seemed perfect. They are actually neither scone nor cookie but somewhat of a cross between the two. 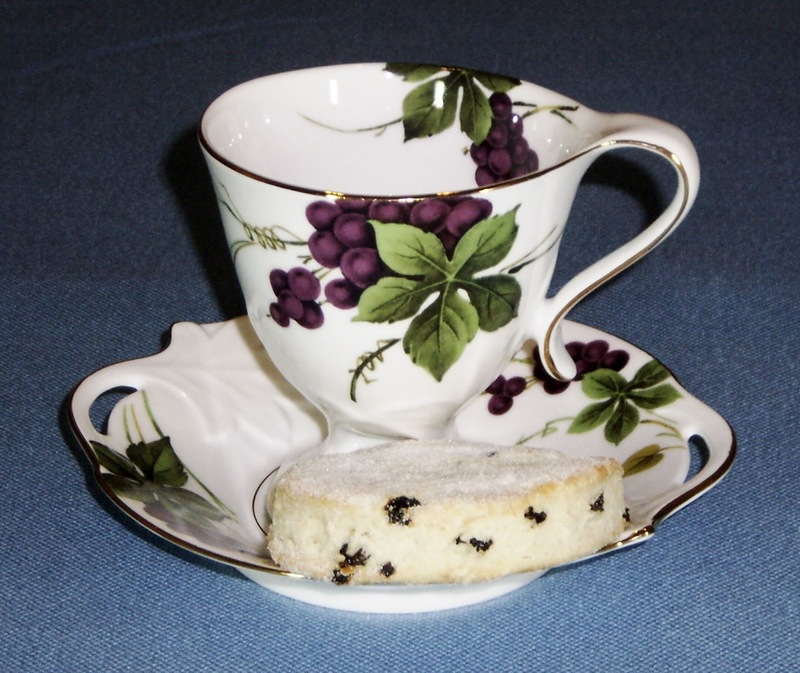 A Yorkshire creation, they date back to the mid-nineteenth century and, traditionally, are a simple currant-studded biscuit, delicately flavored and lightly sweet — delicious with a cup of tea and popular in the North country for elevenses. Over time, additions have been made to the basic recipe such as orange and/or lemon zest, cinnamon, nutmeg, etc. Betty’s Tea Room in York is famous for their Fat Rascals which sport smiling little faces made with cherry eyes and slivered almonds. No one seems to know when this practiced originated, however, its precisely the fun touch Cissy would have added to delight her children (and Henry too!). Reflecting on all of this, “Rascal” would have been a perfect name for Milo. He was a bit of a scamp in his puppyhood to which my rocking chair still attests. His chew marks are quite visible on the front runners to this day. Of course, I’ll never smooth them off. Tomorrow, May 1st, our “puppy” will celebrate his seventeenth birthday! In honor of his birthday, enjoy the recipe for traditional Fat Rascals below which “yours truly” has personally tested and now has a nice, if diminishing stash for the coming days. Milo won’t be indulging in those but will be enjoying a little steak to be sure. · Combine flour and salt in bowl. · Cut in butter, rubbing it into the flour until a fine crumb texture. · Add sugar and currants. · Add just enough milk/water mixture to make a firm dough. · Roll out dough on a floured surface until ½ inch thick. Cut into circles with a 3-inch biscuit cutter. · Dust with sugar and transfer to lightly greased tray. Bake 400° F (200° C) 20 – 25 minutes until a light golden color. My notes: These are very delicate in flavor, not overly rich or sweet which is welcomed. They would be delicious served with a bit of clotted cream and jam. On the other hand, I can see where a small amount of orange or lemon zest in the recipe would brighten the flavor and be lovely, possibly even with a touch of cinnamon — whatever you are in the mood for. When rolling out dough, measure ½ thickness carefully to yield 7 to 8 three-inch wide Fat Rascals. A smaller cutter can certainly be used if desired. Wonderfully interesting post. Do you know that in a way it's as interesting as the book. Please, more ... ! The way things are created is often funny or unexpected ... I love when questions I asked myself once are answered ... I'm simply like that ! A delicous recipe, do you thing currant could be replaced by blueberry (cannot eat currant). The cup and saucer are beautiful ; I like the style and the colors (green and purple are my favorite !) and of course the pastry seems yummy !! Thank you again for sharing this with us. I LOVE it !!!!!! In the book, Fat Rascals are the viscount's favorite - "Intolerably good," Adrian proclaims. I suspect he liked the addition of a bit of orange or lemon zest from the trees he came to grow in the Orangery. I also suspect there was a lively correspondence between Vanessa and Cissy as they further experimented - including adding little faces to the scones/cookies. And yes! I think any dried fruit would be an excellent additions: blueberries or cranberries or cherries, perhaps. Maybe, even berries infused with a little "spirits" perhaps . As is, the plainer cookie is a wonderful complement to a more flavorful or strong beverage. Those who don't like anything overly sweet should also like the traditional Fat Rascals. I'd love to know what others come up with. Love this post and seeing Milo as a little puppy. Aww, what a sweetie. The recipe sounds yummy if I can figure out how veganize it! Nice job! Making of "Shades of the Past"